Having abandoned the shape focus last week, I realised that I could prevaricate no longer and need to be clear on what I wanted to achieve in this week’s class with regard to essential shapes. To this end, I re-read the course material and noted that the author advises beginning in the centre of the body and working outwards from there. So I decided that I would do this for all of this evening’s drawings to see if it helped in judging proportions. In the first drawing, below, I drew in the main shapes, which included dividing the torso across the waist (my starting point), in order to get a better sense of which leg was supporting. The head is still small (but again the model was standing on a stage above us). However, the shapes are obvious. This was meant to be a longer pose but the model had cramp in her arms after about 15 minutes and abandoned the pose. B pencil in A4 sketchbook. Having successfully recognised major shapes in the first drawing, I got into my stride in the second drawing. Thinking in shapes helped with foreshortening and also with head shape and hair line. Working out from the centre of the body helped with judging proportions. Focusing on negative spaces framed by arms or legs and the torso also helped with positioning limbs at correct angles. I drew the main drawing in 10-12 minutes and then tried to draw it again quickly in order to block in tone but time ran out. B pencil in A4 sketchbook. About 15 minutes. Still thinking in terms of shapes, I changed to an A3 format. This time, I wanted to add tone, having laid in the main shapes. Again, conceiving the legs as shapes helped with foreshortening in this pose. The position of the supporting arm looks rather uncomfortable, so cannot be correct. I added tone quickly in the last minute using a light sepia conte pencil and wash, and didn’t quite finish. B pencil with light sepia conte pencil and wash in A3 sketchbook. The next pose was also 15-20 minutes. 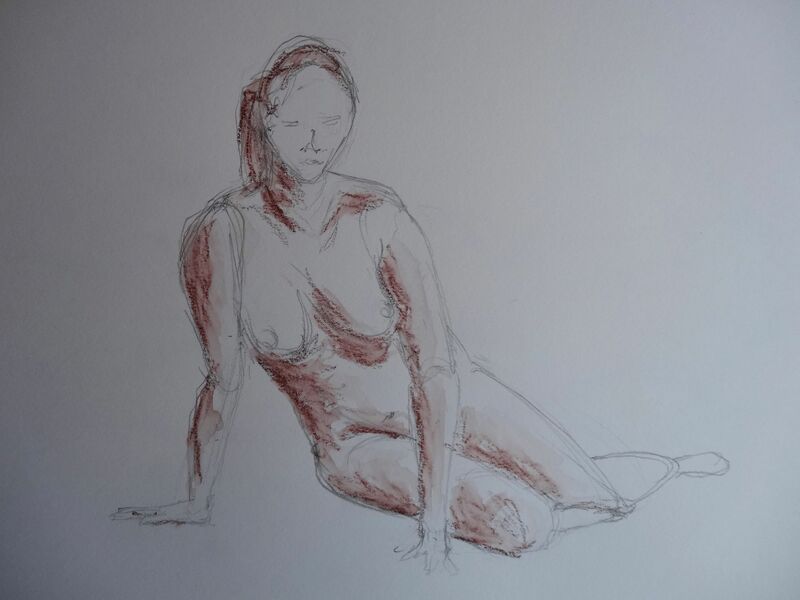 Although I had begun drawing from the middle of the body, the torso was initially much too long in relation to the legs, and I had to shift the buttocks over to the right. The legs may still be a little short, although they are foreshortened. It isn’t clear where neck and shoulder meet. I didn’t have time to apply a wash but quite like the crayon as it is. B pencil with light sepia conte pencil in A4 sketchbook. The following three poses were quick ones of 5-10 minutes. I don’t usually time them and often the time intended for the pose changes because the model can hold it a bit longer, or alternatively can’t hold it any longer. The first pose below was about 5 minutes This gave me time to block in shapes. From the angle at which I was sitting, the thigh of the model’s supporting leg should be partly concealed behind (her) right knee. This probably required an adjustment to the lines of both legs but there was not enough time to resolve this. Light sepia conte pencil in A4 sketchbook. 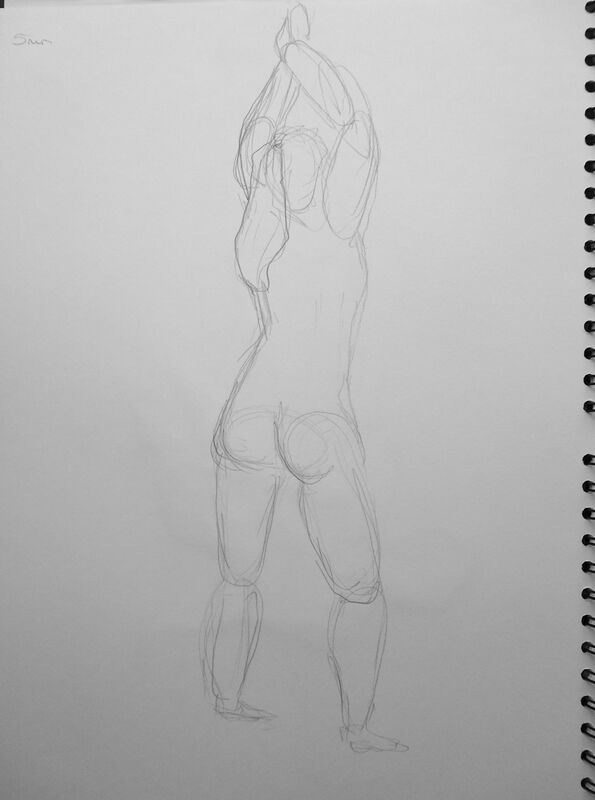 In the second short pose, using shapes helped me to find the position of the hands and arms. The shape beneath the model’s left shoulder is her ponytail! I haven’t defined her should and neck line, which would add clarity to the position. Her legs seem short relative to her upper body; even allowing for the fact that she is in a stretched pose, they are a bit short. Most of her weight appears to be on her right leg. I am not sure if this was the case so should try to make notes of where the weight appears to be so that I can evaluate whether this matches with the drawing. B pencil in A4 sketchbook. In the final short pose, the focus was the same as before but I couldn’t get the proportions to work. It is unclear which leg is taking most of the weight, although from the hip line, it would appear to be the (model’s) left leg, which is angled slightly behind her. I redrew the legs in attempt to capture the correct angle and slightly foreshortened calf . I noted on the drawing afterwards: “Proportions all wrong – torso too long / legs too short / hips too wide!”. B pencil in A3 sketchbook. We then returned to longer poses of 15-20 minutes, which was about the longest of any pose this evening. As noted earlier, focusing on shapes helped to capture the position of the arms and also buttocks, legs and hair line, in particular. Light sepia conte pencil in A3 sketchbook. The last drawing of the evening was difficult, as can be seen from the size of the chair relative to the model! She was sprawled across the chair but her torso must be too long as it doesn’t fit on the chair properly. I am not sure if the back of the chair is correct – size in relation to the seat and the model’s position and need for support from the chair don’t look right. Also her head appears small in relation to the rest of her. She was having a conversation with our tutor and turned away slightly to face him during the pose, so at the last minute, I tried to adjust the facial line, which doesn’t work. The drawing is not accurate but it does capture her mood. Our tutor had tried to persuade her to pose with a jacket clung over her shoulder, which she refused to do, saying that it wasn’t life drawing, before slumping down in the chair! Light sepia conte pencil in A3 sketchbook. Continue to begin drawing from the centre. 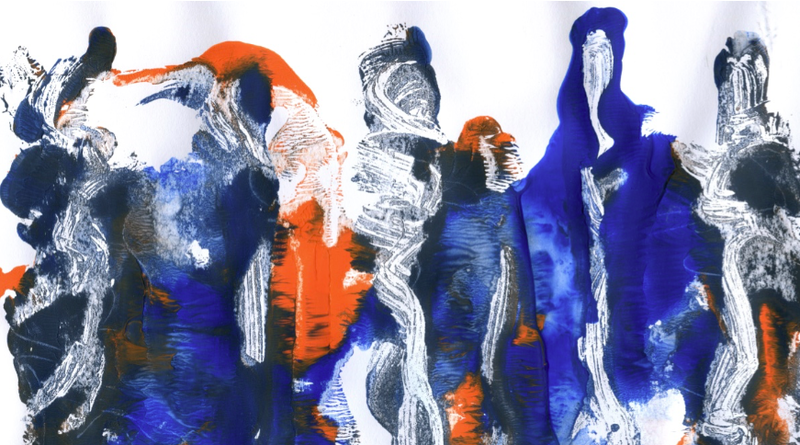 Develop a better sense of light falling on the body in relation to muscles – maybe spend a little less time on details and aim to take the last few minutes of drawing time in building up tone.